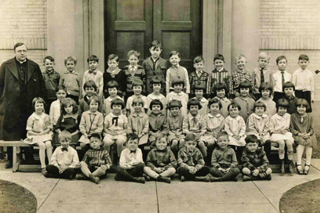 In 1922, a year after Immaculate Conception Church was built on the corner of Rozelle and Central Avenue, the Sisters of Mercy founded Immaculate Conception Elementary School, housed within the three-story parish building. The following year, the school incorporated a co-educational high school, and the parish church, elementary, and high schools shared the building, which today holds only the elementary school. The Sisters of Mercy maintained educational responsibility for the schools until 1990, at which time they entrusted the schools to the parish, dedicated laity and alumni. The spiritual and educational influence of the Mercy charism is still strong on campus. The campus still celebrates “Mercy Day,” and several campus buildings bear the names of Mercy Sisters. In 1950, Monsignor Merlyn F. Kearney, pastor of Immaculate Conception parish, received permission from Bishop William L. Adrian to convert the co-educational high school to an all-female student body. In the fall of that year, 32 freshmen and sophomores were enrolled. The crypt of the church was converted into an auditorium and temporary gymnasium to accommodate the rapid increase in high school enrollment. As enrollment topped 350 young women in 1956, Monsignor Kearney announced plans to construct a separate high school facility on the east side of the campus. The seven classrooms and science laboratory were completed in 1959. Enrollment steadily increased, and by 1975 the high school physical plant consisted of four buildings including a full gymnasium, administrative offices and a library. Growth in the elementary program continued with the addition of kindergarten in 1988 and a pre-school program for 3 and 4-year-old children in 1994. From 1993 until 2003, elementary grades were for male and female students; the Middle School was incorporated into the High School (females only) program. In 2003, Middle School once more became part of the Elementary School’s responsibility and was again open to male students. During the 2007-2008 school year, sixth-graders became part of the Middle School. In 2002, Cathedral Rector Reverend Val Handwerker, who previously served as the school’s first president on an interim basis, formed the Immaculate Conception Cathedral School Board. That same year, the elementary and high school merged once again and became Immaculate Conception Cathedral School, grades Pre-K3 through 12. In the fall of 2008, Reverend Handwerker petitioned the Diocese of Memphis to designate the campus as a “unit school,” recognizing the connection between elementary and high school as one campus with one mission and vision. Immaculate Conception Cathedral School is the only parish high school in the Diocese of Memphis. ICCS accreditations include memberships in the Southern Association of Colleges and Schools and the National Catholic Education Association.